The thyroid gland produces hormones that influence nearly every metabolic process in the body, including temperature, heartbeat and energy. Thyroid disorders range from a slightly enlarged one commonly called a goiter – which may not require any medical attention – to serious conditions including cancer. The most common thyroid issues include the overproduction of thyroid hormones known as an overactive thyroid or hyperthyroidism, and the underproduction of hormones known as a sluggish thyroid or hypothyroidism. Of these, the most prevalent is underactive. 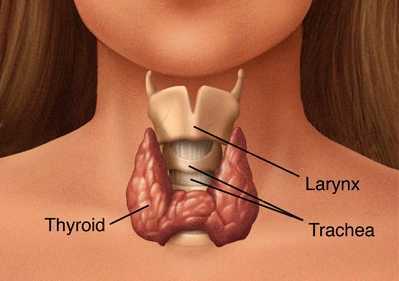 The thyroid gland is butterfly shaped and located in the neck just above the trachea. It is estimated that 20 million in the US alone have some form of thyroid disease, and of these nearly 60% are unaware of their condition! Women suffer in far greater numbers than men, and nearly one in eight will develop a thyroid issue during her life. The causes of thyroid diseases are still not fully understood. What we do know is that it seems to be genetic, sometimes an ‘autoimmune attack,’ sometimes environmental toxins are involved, sometimes it’s a nutritional deficiency, and sometimes even pregnancy and stress are the cause. The underactive thyroid is the most prevalent thyroid disorder, and the most common cause is dietary, specifically a deficiency of iodine and protein, the two key ingredients in our thyroid hormone. Cancer of the thyroid is rare, occurring in omly 5% of thyroid problems. People who had radiation to their head and neck during their youth, usually for adenoids or acne, have a higher risk of developing thyroid cancer. Signs of thyroid issues include fatigue, depression or sadness, anxiety, loss of hair, change in appetite or taste, unexplained weight gain or loss, difficulty concentrating or fuzzy thinking, sleep issues and disturbances, dry skin, rapid heartbeat, lack of sexual interest, changes in bowel movements, menstrual changes, as well as high blood pressure, fluctuations in body temperature, voice change or a lump in the throat, high cholesterol and difficulty getting pregnant. All of these symptoms can be signs of other issues as well so it’s important to see your doctor for the necessary tests. A simple blood test is all you need to find out fr sure. Selenium is found in three organs of the body: the kidneys, liver and thyroid gland. It is a necessary component of thyroid hormone production. Selenium is required for the production of enzymes in the thyroid that are needed to set your metabolic rate and keep your metabolism in good working order. It’s important to know that supplements are not the answer since they can actually aggravate thyroid conditions, so it’s best to get your selenium from fresh vegetables and fruits! Zinc plays another essential role in thyroid function. It is required to convert the inactive thyroid hormone T4 into the active hormone T3. It is also necessary for the proper functioning of the pituitary gland to signal the thyroid into action, and also promotes the body’s thyroid receptors inside the body’s cells. All this means that low levels of zinc can lead to an underactive thyroid. Antioxidants such as vitamin C, A and E, and B-complex compounds are also especially useful in maintaining a healthy thyroid. Fiber is very useful in helping to reinforce a healthy system and thyroid gland. Iodine is necessary for all the building blocks of healthy thyroid hormones! Chlorophyll is yet another important ingredient for a healthy functioning thyroid. Cruciferous vegetables such as leafy greens, broccoli and Brussel’s sprouts provide everything essential for a healthy thyroid - vitamin C, A and E, and B-complex, fiber, zinc, selenium and chlorophyll. Blueberries are abundant in antioxidants and fiber. Tomatoes are rich in selenium, zinc and the antioxidant vitamins C, A and K.
Squash is an excellent source of vitamin C, iodine, zinc, B-complex and fiber. Peas are rich in zinc, vitamin C, B-complex compounds and fiber.